Freight logistics firm AV Dawson is celebrating after securing its first contract to move containers by rail since work on its intermodal freight facility was completed. As a boost to a long-term existing contract AV Dawson will transport up to 24 tar tanks per week from Tata Steel’s Port Talbot facility to Koppers, at Port Clarence, Teesside. The firm’s managing director Gary Dawson welcomed the new contract and said it demonstrated the firm’s commitment to government objectives to move heavy freight from road to rail transport. Neil McShane, rail manager at AV Dawson, added “This contract with Tata Steel is more cost effective as it involves transporting the coal tar alongside the existing steel coil that we transport for Tata. “The direct rail link into our facility increases efficiency and supports our drive to reduce the business’ environmental impact. Under its existing agreement with Tata, AV Dawson acts as a north east automotive distribution centre for Tata’s steel coil, with the firm’s steel being stored in its climate-controlled warehouse before being transported via its road haulage fleet to customers such as Nissan and Steel & Alloy. AV Dawson receives three weekly deliveries of steel coil by train, and identified additional capacity on these trains to transport the coal tar – a product that has a range of industrial uses. The Tees Riverside Intermodal Park (TRIP) was part of a £12.5m three-year investment plan AV Dawson embarked onto develop its 100-acre Tees freight terminal in Middlesbrough. The Intermodal terminal has now reached more than 400 units in storage and continues to grow each month. 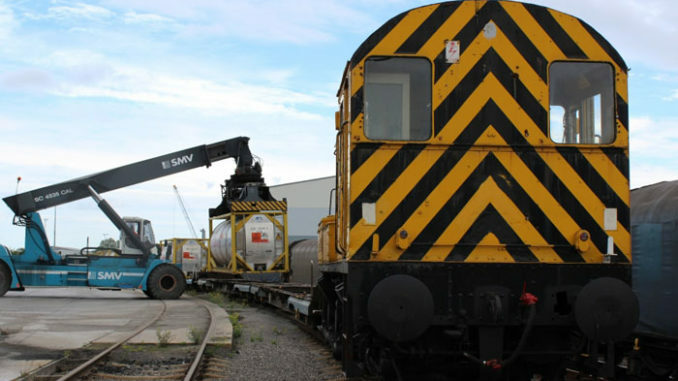 From its base on Riverside Park, Middlesbrough, AV Dawson owns and operates one of the largest independent rail terminals in the North of England and has also has a 99-year lease to maintain and operate Middlesbrough Goods Yard.